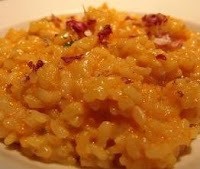 In the lands of Risotto just about anything can turn into a delightful, creamy dish. 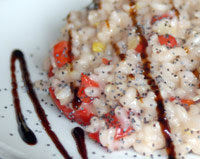 I have not found recipes for Risotto with Yellow Bell Peppers and Gorgonzola. It was something I put together since a creamy Gorgonzola was in the fridge and Yellow and Red Bell Peppers were on sale. This is not to say that there are not recipes available, simply that I have never seen one. Much of our cooking happens like this. Traditional methods or recipes fall prey to “what do we have in the fridge” or “think about these flavors together.” I must confess that Stuffed Peppers is also on the brain and while most recipes will call for boiled rice instead of risotto I prefer to make a risotto with the ingredients and eliminate the egg holding the filling together. Melt 3 tbsp butter in a heavy pot over medium high heat. Add the diced onion to the pot and sweat the onions until transparent. Add the rice. Stir the rice into the butter and onions coating the rice for about 1 minute. Pour the wine into the rice and stir quickly for 1 minute. Add 1 ladle of broth. When the broth begins to boil check the timer. It will now take 22 minutes to cook the rice. As the broth evaporates add another ladle of broth. Stir constantly the rice. Continue until the 10 minutes has passed. Add the thinly sliced peppers and cook everything for an additional 10 minutes. Add the Gorgonzola and cook for another 2 minutes stirring constantly. Turn off the heat. Stir in the remaining 1 tbsp of butter and the Parmesan cheese. Let rice sit for 1 minute (mantecare). Serve hot in individual plates.